Boss Dean Austin has called on his players to repeat the intensity and quality of the performance in last season’s Sixfields win over Plymouth Argyle as they look to kick-start their stuttering season. Town have endured a difficult start to life in Sky Bet League Two, winning just once in eight matches and failing to register a victory at the PTS Academy Stadium in five attempts in all competitions. The Cobblers haven’t claimed a win on home soil since Argyle were dispatched 2-0 back on April 21, with a John-Joe O’Toole strike and a Sonny Bradley own goal securing the points as the team battled for league one survival. 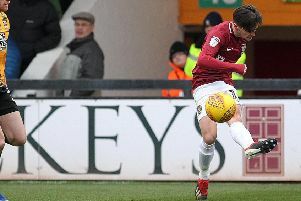 That win was also the first at Sixfields for three months, meaning the Cobblers have won just once at home since they saw off Milton Keynes Dons 2-1 on January 20. It is a miserable record, and goes some way to explaining the frustration of the club’s loyal home supporters, who booed the team off following their abject performance in the 3-1 loss to Cheltenham Town in their most recent home outing. Up until that game, the Town fans had been largely supportive, but Austin understands the fans have ‘suffered’, and that it is down to him and his players to give them something on the pitch to get excited about. “We have a great following here, but ultimately we have to give them something so they really want to get behind the team and be the extra man,” said the Cobblers boss. “If we go back to the Plymouth game at the end of last season, we were unbelievable. “I analyse most things, and from that day I look at the team, I look at the shape, I look at the fight and the desire, and we had a 12th man that day - but how we played was our 12th man. “Our punters have suffered for far too long, the players have suffered, and it’s not through a lack of effort. “If we are not good enough, we are not good enough. “And if I didn’t think we were good enough, I would sit here now and say ‘this is going to be tough’, but I don’t think that. Of their four home league games so far this season, the Cobblers should have won the first three, but only claimed two draws, and they were also completely dominant for the opening 30 minutes against Cheltenham before retreating into their shells after going behind. Austin is still satisfied with how his team is performing in general, but knows they have to perform where it matters, at both ends of the pitch. “The performances this season have not been bad, and I’m afraid I can’t accept it if people don’t like the performances,” said the Town manager. “If people don’t like the kind of football that the team is trying to play, then I think that is unfortunate and something I can’t control, because on the whole the football has been very good this season. “But, as I keep saying to the boys, the game is won in both penalty boxes and we haven’t been good enough in either.